Reject: “Loud Burper” Is Just Two Words. | A Daily Dose of Zen Sarcasm! Reject: “Loud Burper” Is Just Two Words. I love the times when I get to ride the Metro by myself. I don’t think I need to emphasize the fact that I love my family and friends, and that I cherish the times I get to ride with them. Suddenly images from the time two of my friends-who-also-happen-to-be-mothers and I rode to the Building Museum and had an animated conversation about guys who are hot versus guys who are ugly-hot flood the mind. Clive Owen was the hottest ugly-hot guy by consensus, by the way. Daniel Craig was also on the list. But anyway, yes: I remember fun times and scary times and funny times and times when the wrong train was boarded by accident. You get the idea. But when you ride by yourself you get to see things. Or well, *I* get to see things and see people and think about what it all means. Like the way the green train I was riding on Saturday afternoon was absolutely delighted and awed by the way three beautiful boys –maybe in their late teens, maybe in their early twenties, but still with that lovely flush of utter youth– were carrying on a conversation in American Sign Language. You could really hear only the sounds that escaped them– the sound of the train against the rails, the occasional thumping of the cars, a polite sniffle or a cough. Otherwise, everyone in our car was making an effort to pay attention to their vivid signing. I was looking at them intently– well, at their reflections on the car’s windows. I couldn’t take my eyes off them: they were so dynamic and vibrant and filled with life in their silence that wasn’t. And there it is: that is why I like to ride on the Metro. Because you can share moments like those with strangers; moments that are just as intimate as those you share with friends and family, but that much more meaningful because you’ve bonded with people you may never see again. And this bit o’ fluff brings me to an exercise I saw over at The Chronicles of Tewkesbury. It consists of something that is not necessarily easy, but it’s one of those introspective things that are to me like flames to a moth. Inspired by a book called Not Quite What I Was Planning, and originally devised by BookBabie, this meme asks you to write a SIX WORD memoir. 1. Write your own six-word memoir. 3. Link to the person that tagged you in your post and to this original post if possible so we can track it as it travels across the blogosphere. Here are mine. Yes, "are". Because this is hard and I need validation through comments, so maybe you can tell me which one you like best, yes? Thinking deeply, so you don’t hafta. Cat thinks she’s a damn mouse. Here, there, everywhere, all over again. Living life as Plato’s Allegory, redux. Bringing Annoyingly-Introspective Back Since 2005. Housework won’t happen with prayers alone. Alrighty. Some are cheeky, some are fo’ realz– appropriately, there are six and hey! Thirty-six is one of my favorite numbers. I am tagging some folks but please, by all means feel yourself tagged if you’d like to do it: I think it’s a good exercise in distilling your essence –whatever the hell that means. Ghosty, Florinda, Bohemian Girl, Anita, Alejna and OC Girl: consider yourselves über-tagged. You know that when the German comes trotting out, things are, like, totally serious. 18 Mar	This entry was published on March 18, 2008 at 4:00 pm and is filed under Quizzes and Memes. Bookmark the permalink. Follow any comments here with the RSS feed for this post. Oh, frak. Tagged. OK, next post, I’m on it. I like your set of six sixes. Perhaps I’ll steal it from you that way. As for which I like best, I’m most partial to #2, perhaps followed by #3. I’m in that book! Have you bought it? I highly recommend it, it’s very interesting (and I’m not just saying that because I’m in it ;)). I like to people watch too. The way you described it was beautiful! The way you described your experience on the Metro is exactly how I feel about people watching. I did a 6 word memoir as a comment on another blog some time ago, but maybe one of these days I’ll do my own post on it. Here from SheWhoBlogs and I have to tell you, I love the way you write. I’ll definitely be back. Numbers 5 & 6 are my favorites! Waving at you from New York. Well, I like all 6 however you missed the most important one. A Random Dose of Zen Sarcasm. I still think you should collect your posts together as a sort of memoir novel. Be something interesting to pass on to Herr Meow some day. Thanks for the project! I’ve been thinking about doing this anyway, but now I really will. 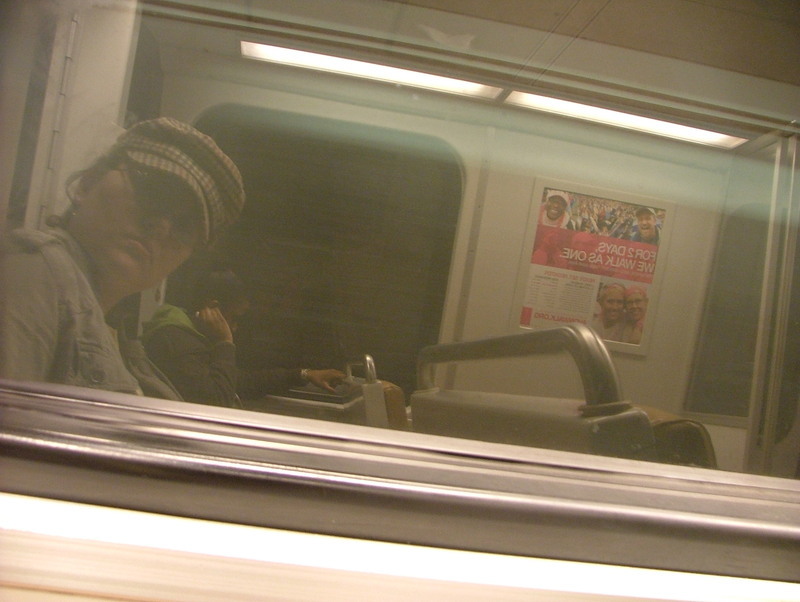 My son doesn’t own a car and he’s a regular on the DC metro – he’s got some stories too. For the record, I like #3 best. Madame M: All of these are fabulous! But I especially like the last two. Divine! Well done. I’m glad you participated. So true! I love riding the subway along and you are so right. It’s only when you’re riding solo that you manage to take in all that is going on around you. Love my public transportation (and I will admit, I truly miss the cleanliness of the DC subway system, along with the oh so plentiful escalators!). And I absolutely love the six word memoir! I am going to contemplate on it and totally include that in on my blog. Wow, this is going to distract me all day until I can come up with one. Although, I love your idea of coming up with a few for people to comment on! I love #4 and #5. I wasn’t familiar with Plato’s Allegory. Very interesting!